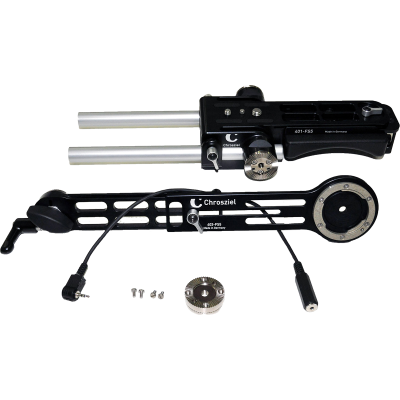 Kit for Sony PXW-FS5 with Light Weight Support and Handgrip Extender: 401-FS5 LWS with extensible Shoulder Pad, 2 Hirth Rosettes, V-Lock Plate, 401-FS7-5-03 Tripod Adapter Plate, 2 rods Ø 15mm, length 205mm. 403-FS5 Handgrip Extender with bajonet lock, incl. extension cable with jack connector, length 300mm, Hirth-Rosette with screws.